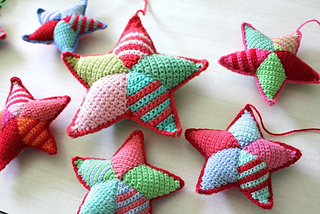 Adorable multi-color stars. Use scraps of worsted weight. Adjust hook size to the size of star, from small to large. Would be wonderful for Christmas, the 4th of July, a new baby mobile, of for decoration. Can personalize to own home decor, or go wild and use varigated yarn mixed with solids.